It’s no secret that Amazon is a go-to for many of us for virtually everything, but clothes?! It’s only in the last few months that I’ve started to pay attention to the clothes on there and let me tell you–there are some REALLY good finds! However, there is also a lot of other not so good stuff, so you have to be selective. If you have Amazon Prime, one way to know that you are getting reliable clothes is to try the service called Prime Wardrobe. It’s free for all Prime members and it allows you to choose 3-8 items and have them shipped to your house at no cost to try on. That’s right, unlike many of the styling services available now, you don’t pay anything! You have the clothes for a week and then you return any items you don’t like. And yes, you can return all of them and not have spent a dime. Win win right?! You can specifically search for Amazon Prime Wardrobe items, or you can scroll through clothing items and there will be a button that says “Try this item through Amazon Prime Wardrobe”. With my pieces, I went for staple basics and I also tried the most popular brands on Amazon Prime. This drapey cardigan is super lightweight and is so perfect for spring and summer! These joggers were not my favorite, but I think they would have fit better if I had sized up. My favorite thing out of this whole outfit were the shoes–it feels like I was walking on clouds! These shoes are Dr. Scholl’s, a brand I usually associate with being matronly, but not the case with these. Cute and comfortable and therefore very practical! 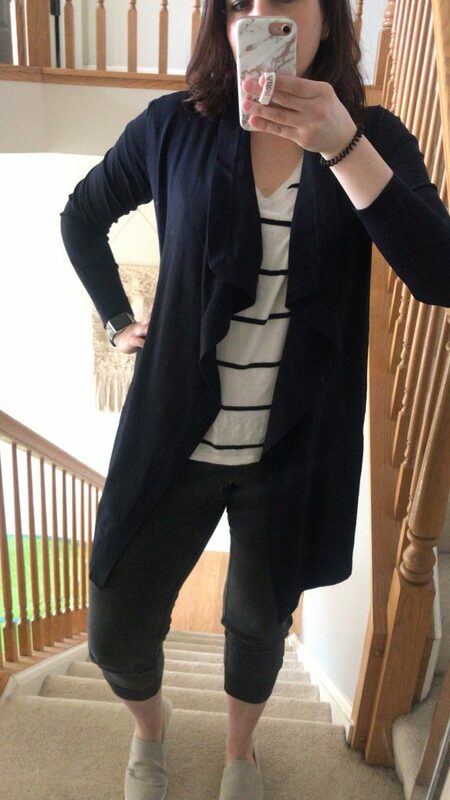 The striped shirt was not from Amazon, but I linked a similar one that only costs $6! 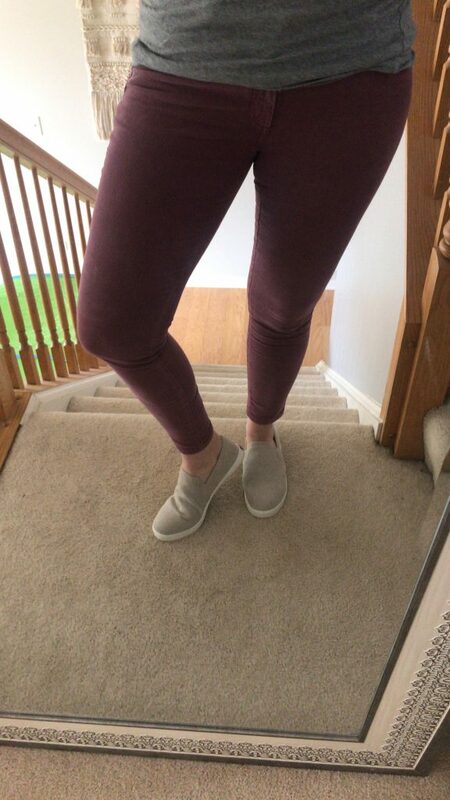 Daily Ritual is one of the popular brands on Amazon, so I tried these pants from them and I love them! They are a pretty shade of pink and they are corduroy, but they are a lighter, more stretchy kind. They are definitely a great staple for spring. Grey tee is from J.Crew Mercantile, a more affordable JCrew version, and I’m still loving the shoes of course! I do particularly like that you can choose to have shoes as part of your Prime wardrobe because that way you can put together a whole outfit! Excuse the dirty mirror in this picture, but here is a basic black T-shirt dress I ordered styled. This dress is a great basic, however, it runs small and is very body hugging. I would have probably liked it more if I had sized up. It is very affordable at $18 and comes in a number of colors! Shoes and jacket are not from Amazon. This floral top is only $22 and comes in several colors. It is flattering and has delicate florals for spring! This $20 light sweatshirt is so cute with the pink camo pattern and will be a staple I’ll be wearing all season! This dress is under $24 and is perfectly light and flowy for spring. It comes in a number of different colors and would also be great for pregnant or nursing mamas. Those are my Amazon Prime finds for now, which one is your favorite? I think my favorite item was the non amazon jacket lol other than that I love your looks! I was truly curious about their clothes subscription thanks for the insight. I’ve always wondered about the quality and fit of clothing sold on amazon. This sounds like an awesome service. I’ll have to try it! We totally have similar styles! I have been curious and hesitant to use Amazon wardrobe and your post is so helpful. I love that floral top. I’m going to try it out. i love it! You look comfortable and stylish. Just perfect. Gorgeous finds. I like the light sweatshirt. Excellent for the spring season!